Mettete la farina in una ciotola, fate un buco nel mezzo, mettete le uova e il sale e sbattetele con una forchetta. Incorporate man mano la farina, prima con la forchetta e poi con le mani. Quando è un po’ amalgamato, mettetelo sul tavolo infarinato e lavoratelo fino a che la pasta è liscia, ci vogliono pochi minuti. Lavorate con la parte bassa del palmo della mano con forza. Fate riposare la pasta per 15 minuti coperta con la pellicola. Stendete la pasta: potete usare la macchinetta, se l’avete. Oppure il mattarello.Io la preferisco tirare con il mattarello, perché mi piace un po’ spessa, rimane un poco più ruvida e trattiene meglio il condimento. Dividete la pasta in due e tiratene una parte alla volta.Infarinate leggermente il tavolo e tirate dal centro verso l’esterno. Continuate ruotando ogni tanto di 90° e vedrete che ci vuole un attimo. Per fare le tagliatelle, infarinate poco la sfoglia, fate un rotolo e tagliate a strisce. Disponetele poi su un panno allargando un poco. Put the flour into a bowl, make a hole in the middle, put the eggs and salt and beat them with a fork. Stir in the flour gradually, first with a fork and then with your hands. When it is a bit mixed, put it on a floured table and knead until the dough is smooth, it takes a few minutes.Work with the lower part of the palm of the hand with force.it takes a few minutes. Make the dough rest for 15 minutes covered with foil.Roll out the dough: you can use the machine, if you have it. Or a rolling pin. I prefer a rolling pin, because I likethe pasta a bit thick, it is a little rougher and holds the sauce better.Divide the dough in two and roll out one at a time. Flour lightly the table and roll from the center outward. Go on turning occasionally by 90 ° and you will see that it takes just a moment. 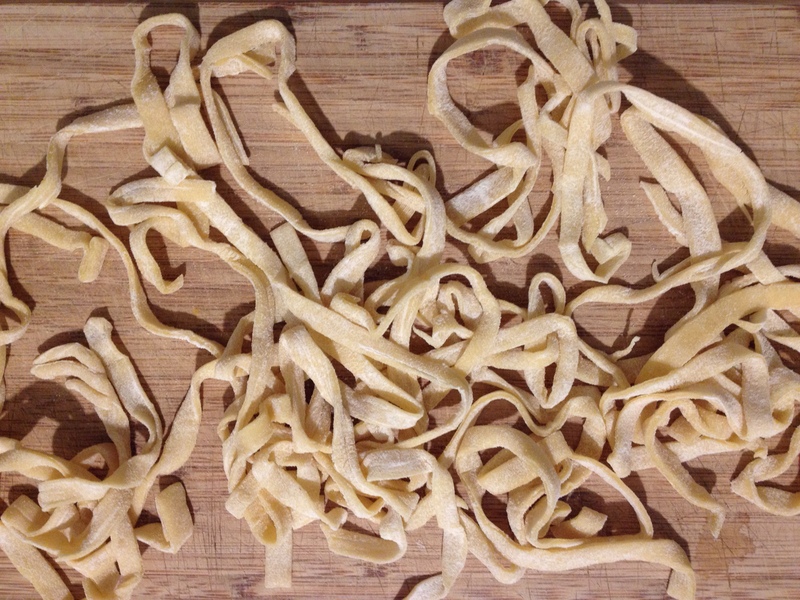 To make the tagliatelle, slightly flour the dough, make a roll and cut into strips. Then arrange them on a cloth spreading them a bit out.